The AccessDPRK blog is dedicated to exposing North Korea via satellite imagery. Discussing domestic, economic and military locations and helping to uncover this hermit kingdom. There is no doubt North Korea is unlike any country on earth. Its heavily regulated society and militarized southern border has actually resulted in some of the most pristine wilderness areas in the modern world outside of the vast tropics. Unfortunately, many of these areas are under threat. I'd like to show you some of these amazing, if not always intentional, wilderness areas. Apart from providing relative military stabilization, the DMZ has also created an unintentional nature preserve 155 miles long and 2.5 miles wide. Not only is it nearly impossible to traverse the DMZ because of the high risk of being shot, the zone also has roughly 1 million landmines left over from the Korean War which makes human movement all the more dangerous. This has meant that the 387 square mile region has been left nearly undisturbed for 60 years, with the exception of two very small villages (one of which is fake and the other, on the southern side, has a population of 218). This has allowed nature to reclaim the area and bounce back not only from three years of devastating war, but also from thousands of years of human settlement and movement. To quote Don Oberdorfer in his book "The Two Koreas", "This pristine nature preserve marks the most dangerous and heavily fortified border in the world." The DMZ from the ground. Within the boundaries of the DMZ there are 2,900 plant species, 70 mammal species, 320 types of bird, and over 80 species of fish. Some of the more interesting creatures include the Asiatic black bear, leopards, and lynx. There are also several animal species that only live within the DMZ. The DMZ plays host to countless numbers of birds each year as they migrate throughout eastern Asia and Japan. Approximately 1/3rd of all Red-crowned cranes (their entire wild population is less than 3,000) use the DMZ during migration. 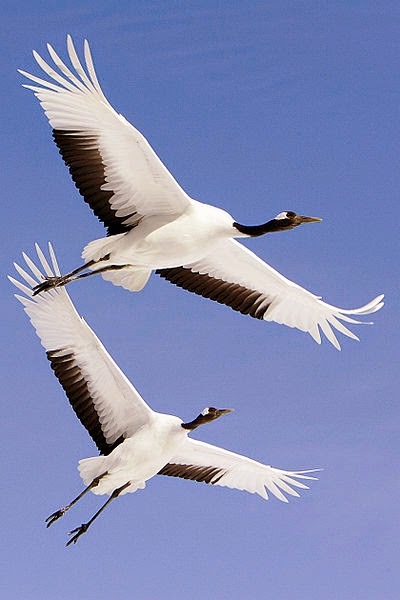 Pair of Red-Crowned Cranes in flight. There are several organizations who are trying to have the DMZ, or at least parts of it, declared a UNESCO World Heritage Site and Biosphere Reserve. Author Alan Weisman has said of the area within the DMZ, "it has inadvertently become one of the most important wildlife conservation sites in the world.” There are, however, several major obstacles in the way of preserving the DMZ, not least of which are the ever-increasing levels of pollutants due to substantial urbanization occurring in areas adjacent to the zone. And, the only way for the full area to be protected is for the North Korean government to cooperate with the South, which offers its own difficulties. Tourism to the zone, over 1.2 million people annually, accounts for 20% of South Korea's foreign visitors. 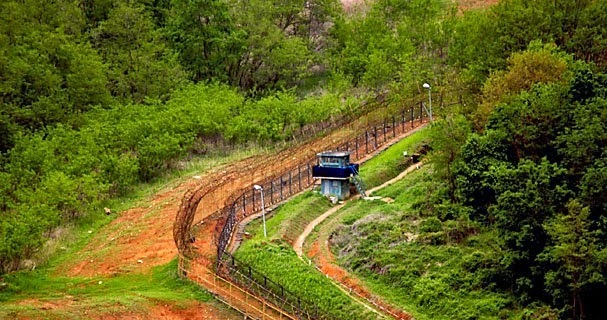 If the zone were to be made into a nature preserve, it would be a boon not only to tourism and the economies of both countries but could help bring the two Korea's back together because of the necessary steps needed to actually accomplish the goal of preserving wildlife within the DMZ. Dotted along the fence are small "border guard" shacks like this one. As I've talked about before, most of the country is surrounded by a fence system. Most of the coastal fences were built during the famine, ostensibly to protect the fishing industry, but most likely (according to testimonies) it was done to prevent people from fleeing the country as well as "stealing" fish. This system, which includes the border fences with China, Russia, and South Korea, runs for thousands of miles, and long segments are actually electrified. The fence doesn't run uninterrupted, there are plenty of breaks to allow fishermen access to the sea (usually requiring them to pass through guarded gates), areas too rugged to need any fence, and places where the fence has either been torn down by locals needing wire or from the simple decay of time and weather. This draconian system has resulted in vast stretches of undisturbed beaches and pockets of forested land in an otherwise barren environment, as huge portions of the country have been denuded of trees for agriculture and fire wood. The distance between the fence and the sea can range from 50 feet to over a thousand. Depending on the measurements, this thin green line actually adds up to several square miles (4 to 25) of relatively untouched territory. The key in all of this is coastal. Notice the difference in tree density on either side of the fence. From the destruction of thousand year old sand dunes, to rare plant species, to animal breeding and feeding grounds, coastal regions the world over are under constant threat. This small strip of land provides a protected zone for wildlife relatively free from those threats. 3D satellite imagery of ~100 square miles of forest. Nothing but a few footpaths traverse the area. 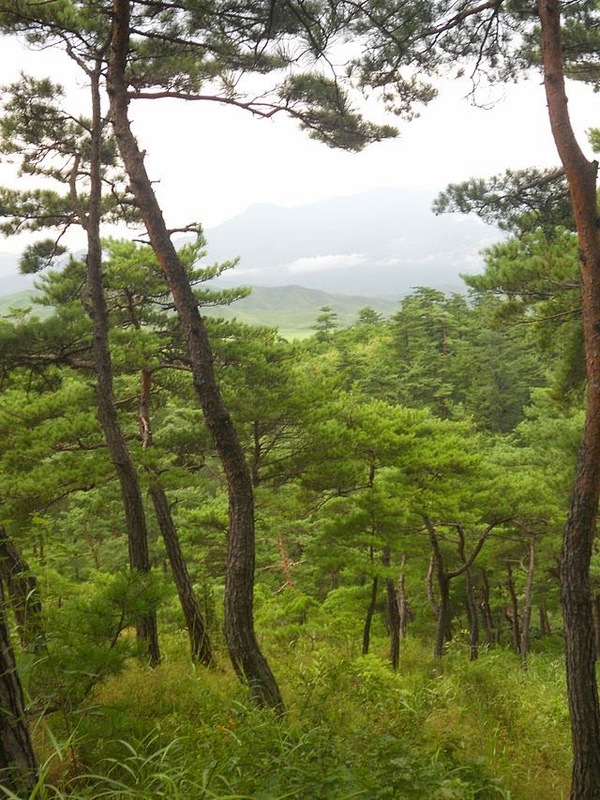 North Korea had vast forests until the 1980s, when drastic changes caused a dramatic decline in both the quantity and quality of forested areas. According to the World Bank, North Korea's forests covered 46% of the country in 2012, down from 53% in 2003 (compared to ~33% forest cover in the US). The amount of forest is due to the mountainous nature of North Korea, which is actually partially to blame for the decline in forests. All land belongs to the government and its use is tightly controlled. Only 22% of the country's land is arable, meaning that the government has undertaken a number of steps to increase agricultural production by cutting down forests to make room for farming. The poorly planned nature of these schemes has led to denuded hillsides surrounding every inhabited area which, in turn, cause devastating flooding and landslides each time a major rain occurs and that happens often). Despite this, there are still plenty of forests, and unlike regions in Russia, China, and South America, where illegal logging and settlement have wreaked havoc on many the forests there, the tight controls on movement and land use has resulted in some spectacular stretches of forest. Of those, around 9.3% are old growth forest (the US has less than 2%). Unfortunately, the remaining forests are being cut down at an ever increasing rate and their future is in great doubt. 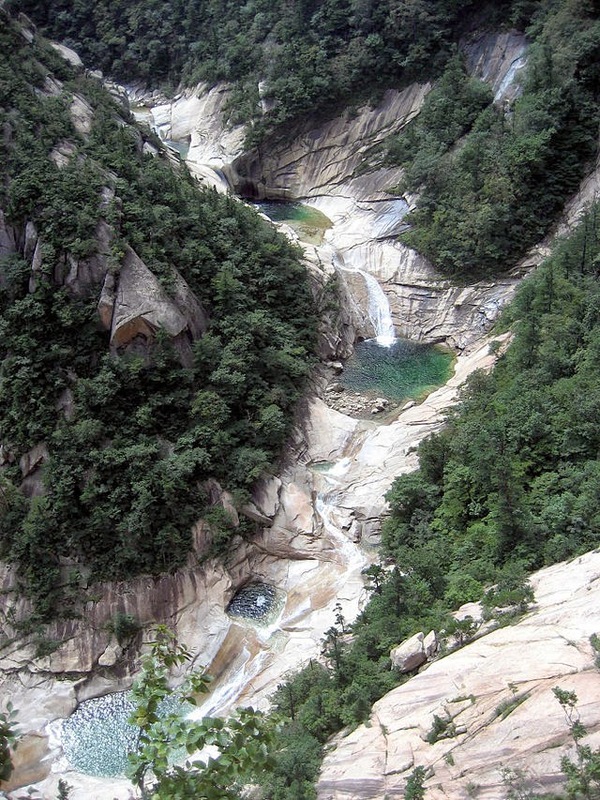 Beleive it or not, North Korea has several national parks. The primary parks are: Baekdu-san (Mount Paektu), Ch'ilposan, Lake Bujo, Myohyang-san, Geumgang-san (Kumgangsan), and Guwol-san. The Mt. Paektu region has the world's highest plant diversity in such a cool and temperate environment. It is also home to a few endangered Siberian tigers (with a global population of under 1,000). 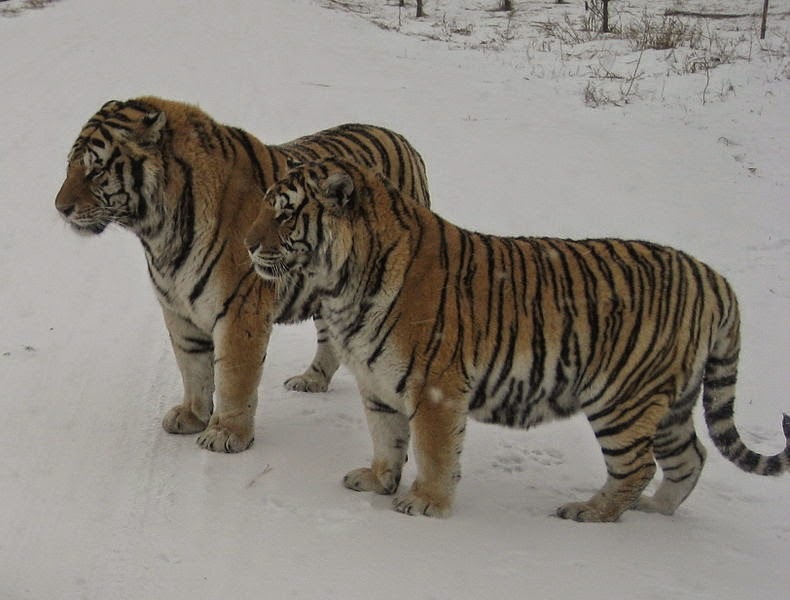 A pair of Siberian Tigers. Mt. 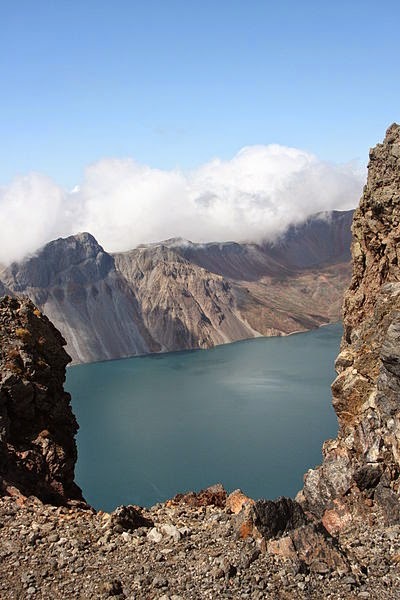 Paektu, or Baekdu, is the highest mountain in North Korea at 9,003 ft (2,744 m). It lies on the border between the DPRK and China and is considered, by both Koreas, to be the legendary ancestral home of the Korean people. The volcanic mountain, with its deep blue crater lake (called "Heaven Lake") and snow-capped sides plays an important role in North Korean propaganda as well as the country's personality cult. The North claims that Kim Il-Sung launched his "victorious" strike against the imperialist invaders from a secret base on the side of the mountain and that his son, Kim Jong-il, was born near the lake (despite actually being born in Russia). The lake even has its own lake monster, the Lake Tianchi Monster, which was first reported in 1903. A view of Heaven Lake. Pilgrimages to Mt. Paektu are very common, with each citizen generally expected to visit the site at least once. 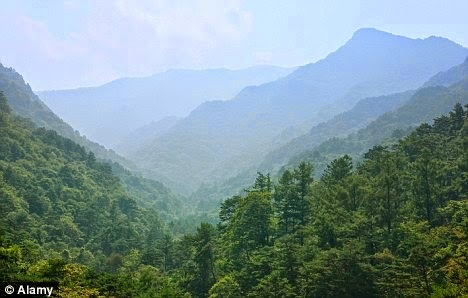 China has sought to have the mountain designated as a World Heritage Site, although this attempt has been controversial. Regardless of the ever-complex political scenery, satellite imagery of the mountain and surrounding areas shows that the pristine nature of the site is under severe threat, especially from logging (although North Korea agreed to prevent logging, they have clearly failed to do so) and the increasing levels of development for the North Korean elite's vacationing. Moreover, even the park & border guards - which are supposed to be among the most loyal - are having to poach and kill wildlife in order to survive since they aren't receiving enough supplies from the government. The image below shows the Mt. Paektu region. The mountain is in the upper left corner, the yellow line is the China/DPRK border. The brown outline, encompassing roughly 250 square miles, outlines forested areas that show very clear signs of logging. The red markers are military sites, the rest show the positions of villas and the primary leadership compound with an entire support village next to it, as well as other locations. Mount Kumgang, or "Diamond Mountain", is a 5,375 foot (1,638 m) high mountain just a few miles from the DMZ. 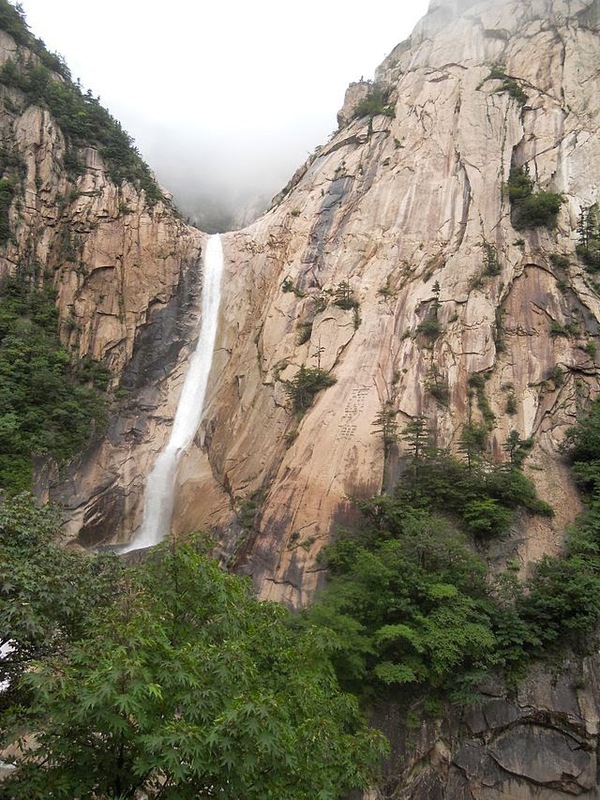 It lies within the 205 square mile "Mount Kumgang National Park" and began as a joint-venture with South Korea to improve relations and tourism. The Park has been heavily subsidized by South Korean companies (as well as the government) but has been closed for several years following the killing of a South Korean tourist by North Korean guards. Currently, only tours operated on the North Korean side are permitted, making the Park effectively out of reach for most western tourists and South Koreans (who made up the bulk of visitors). Mountain view. Image source Flicker. Despite the current situation, Mount Kumgang remains one of the most beautiful places in North Korea. Roughly 96 square miles of the Park have been recognized as an "Important Bird Area" by BirdLife International because it supports Red-crowned Cranes. The mountain itself is made up of granite and diorite which has been exposed over the eons. This weathering has created over 10,000 interesting stone formations and countless waterfalls. The very famous "Nine Pools". A beautiful scene from one of the lakes. Source Flicker. The Kuryong Falls are a striking feature. They drop 246 feet to Kuryong Lake, which according to legend, was the home of nine dragons that defended the mountain. The Park contains mixed broadleaf and coniferous forests. The Park abuts the Sea of Japan and contains several lagoons. Of them, Samil Lagoon is by far the most lovely. 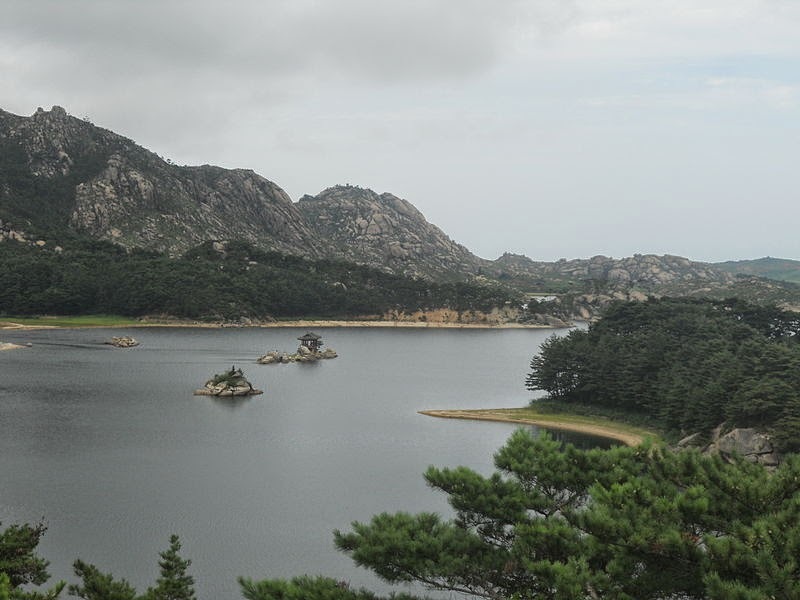 While portions of the Kumgang tourist region are under threat from continued development, the heart of the area, namely the mountains, do seem generally free from settlement and deforestation. It is, truly, the Diamond Mountain. Image notes: pictures come from Wikimedia Commons or compiled from Google Earth unless otherwise noted.